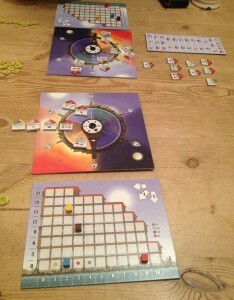 The other player board is the main game mechanic which shows a circle divided into 6 sectors where buildings are placed once they have been bought. The circle has an arm like a clock’s minute-hand with 6 values around the part at the circle’s centre (0, 2, 3, 4, 4+1 and !) – these 6 values each match up to the circle’s 6 sectors. 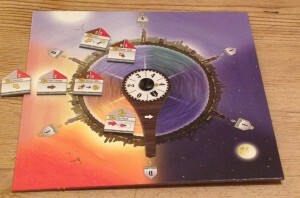 At the end of a round, players both advance their clock hand by one sector so the values in the centre now point at the next adjacent sector – as a result a building that was next to the zero will now be next to the 2; a building that was next to the 2 will now be next to the 3, and so on. Any building now next to the ! symbol is immediately sold for half of its value. On their turn, a player can buy one building in the market by paying the resources (sometimes cash) marked on the building tile and this places it on the player’s board in the sector next to the zero on the clock-hand. Alternatively, a player can use their action to use any effect of any building on the player boards that is not next to the zero. On this player’s board, there is one building in the zero sector, three buildings in the 2 sector, and two buildings in the 3 sector. 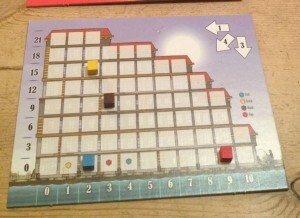 Each building’s tile shows what effect it has and the number it is next to on the clock hand is the number of times the player can use that effect when used; for example, a building whose effect moves a player’s wood marker vertically one space which is next to the 3 when used allows the player to move their wood marker vertically 3 times. Players can use their opponent’s buildings as if they were their own, but must pay 1 cash to their opponent to do so. A used building remains on its owner’s board but still gets placed in the sector next to the zero. So, using any building means neither player can use it again in the same round. The building tiles always enter the game in specific rounds and their effects (and values) generally increase as the game progresses. During their turn, players can sell any of their buildings back to the market to receive cash equal to half their value. When the game ends, players add up the value of their buildings plus any cash – highest total wins. 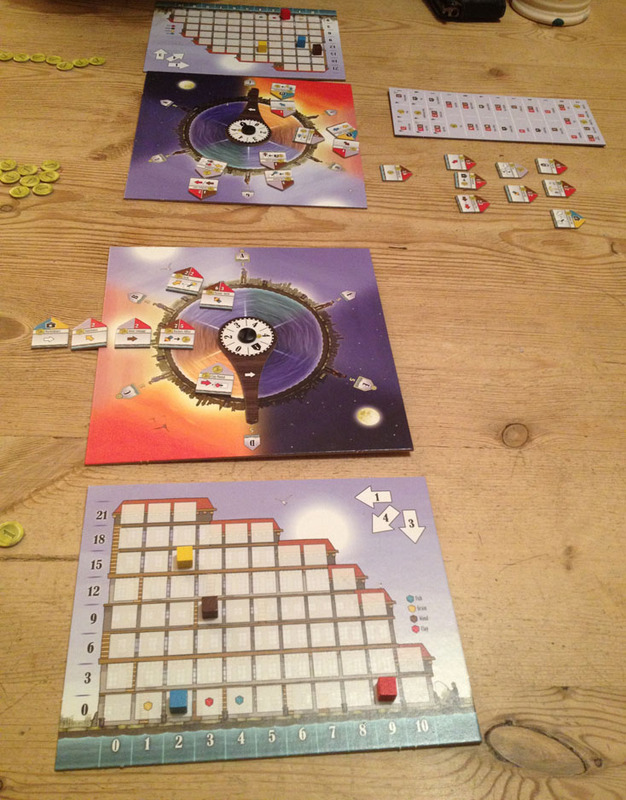 Overall, Le Havre: The Inland Port is a simple game but with continual, tricky decisions to be made. I’m always interested in 2-player Eurogames as many great games that work well with more than 2 players just don’t work well when played with only two. Also, 2-player games are hard to create because of the transparency and only having one opponent to contend with, i.e. if player A does one thing, player B just counters that. However, The Inland Port overcomes this with lots of choices and no way a player can do the same action immediately after their opponent – so, very quickly, your position and your opponent’s become very different. The warehouse board is clever because only moving resource markers in certain directions means there is a limit to continually moving a resource marker in the same direction, i.e. moving right to gain 1 resource will eventually be useless when you reach the right-hand edge and can not go any further. Also, you can only move in certain directions when spending resources which means you sometimes have to overspend, i.e. if a marker is in the far-left column, you would only be spend that resource by moving it vertically downwards, lowering its value by 3, even if only 1 or 2 is required. The player board is also clever because it adds a ‘cooking’ element to the game by which I mean the longer you wait, the better a single use of a building will be. However, you need to consider how likely it will be that your opponent may use it first which would reset it. I’m usually so busy with my own plans that I’m not sure what my opponent’s intentions are to intentionally get in their way, but maybe more plays would give me this skill. The effects of different buildings are quite varied. Whilst a little bewildering at first, there are lots of options to choose from every action and you quickly start to formulate short-term and longer-term plans, although you’ll likely need/want to re-adjust as you go. I enjoyed working out what buildings I wanted to own, which I could afford, which would work well together and which would increase my end game value. Actually, that last one’s important to keep in mind because generating resources feels very attractive and leaves your options open, but resources are worth nothing at the end of the game on their own (unless you also have specific buildings). This player has 2 fish, 9 clay, 12 wood and 17 grain. Buildings that move the red marker 2 or more to the right will not have their full effect. I had a couple of minor issues. First, the game has a fixed schedule for introducing buildings each round so they get more powerful/valuable as the game progresses which is fine; however, it means the players know who will have the first chance to buy the buildings whose end value are based on resources (i.e. 1 cash per fish, or 10 cash per building with anchor icon). For example, the player taking the game’s first action always has first chance to buy the building whose value is based on grain later. I don’t think it’s a massive problem, but it just feels like it could pre-determine some of the players’ strategies. Second, I found the number of actions taken is not immediately obvious – You can usually count the building tiles in the zero sectors, but it’s fiddly as many later buildings with no effects are placed at the side of the board, plus the zero sector moves each round. As a result, the current turn number is not immediately obvious which is annoying as it’s very important. 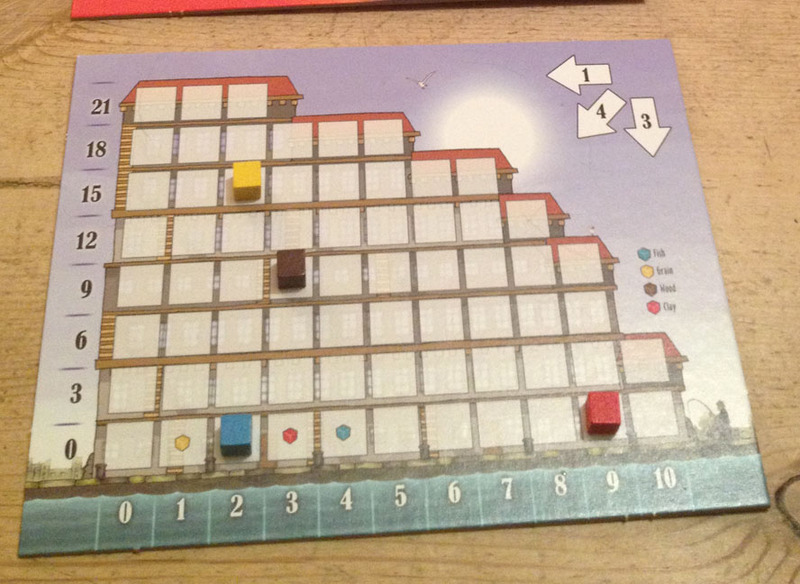 The building chart (showing each building’s cost and entry round) could have been a round/turn track instead (or at least had that on its rearside), especially as the information on the building chart can be better displayed simply by placing all the tiles in rows. 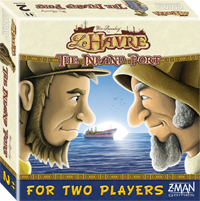 In the end, the two issues above are minor items and Le Havre: The Inland Port is a great 2-player game requiring constant decisions and the great feeling that you don’t have enough actions to do all that you need. I hope I will get to play the 2-player version of Agricola sometime too. This entry was posted on Monday, February 4th, 2013 at 10:15 am	and is filed under Board Game Review, Board Games, Le Havre: Inland Port. You can follow any responses to this entry through the RSS 2.0 feed. You can leave a response, or trackback from your own site.